There were lots of moments during the Presidential Debate last night that had us yelling (sometimes yasss, queen! sometimes oh no he didn’t! ), but we found ourselves getting particularly fired up every time Donald Trump interrupted Hillary Clinton. According to Vox, Trump interrupted Clinton three times more than she interrupted him — 51 times compared to 17 times. (Twenty-five of his interruptions happened in the first 26 minutes of the debate.) And while it’s true that presidential candidates frequently bicker and talk over each in these situations, there was something particularly egregious about last night’s display. Watching as women, the not-so-subtle sexism of Trump speaking over Clinton every time she tried to make an assertion, respond to a point or — heaven forbid! — fact-check Trump was all too familiar. That’s because, as research has shown time and again, men interrupt women frequently — and flagrantly. In fact, one study found that in typical male-female conversations, men make 96 percent of the interruptions. "We speak up in a meeting, only to hear a man’s voice chime in louder. We pitch an idea, perhaps too uncertainly — only to have a dude repeat it with authority," she wrote for Time. "We may possess the skill, but he has the right vocal cords." There were plenty of women on Twitter who saw their own everyday professional lives mirrored in Clinton’s debate experience. And there were men, too, who found Trump’s show of masculinity to be overdrawn and straight-up sexist. Next time you think about interrupting a woman in a business meeting, think about how Trump looked like tonight. Quippy tweets aside, Trump’s brand of manterruption has real consequences. In professional settings, men are regularly given credit for women’s ideas. And male professionals who speak up more often are seen as 10 percent more competent than colleagues who speak less frequently, according to a 2011 study, while female professionals are seen as 14 percent less competent than their less-vocal peers. In political life, the manterruption phenomenon is so common that women in the Obama White House have developed a system for ensuring that their female peers get due credit for their ideas and have their voices heard. They call it amplification and, according to The Washington Post, it works like this: Obama’s female aides will repeat other women’s ideas and then give the idea’s author credit. “We just started doing it, and made a purpose of doing it. It was an everyday thing,” said one of Obama’s former aides, who asked to remain anonymous in order to speak freely. It seems to be working for the Obama Administration so far. Even the President quickly took notice of the “system” and began calling on junior female aides to speak more frequently. "It’s fair to say that there was a lot of testosterone flowing in those early days," said White House senior adviser Valerie Jarrett. "Now we have a little more estrogen that provides a counterbalance." A Clinton White House could be a very different place. As Secretary of State, senator, and first lady, Clinton hired female chiefs of staff and sometimes even had majority-women staff teams. She could presumably do the same as president, which would be a huge shake-up for the nation’s most persistent old boys’ club. 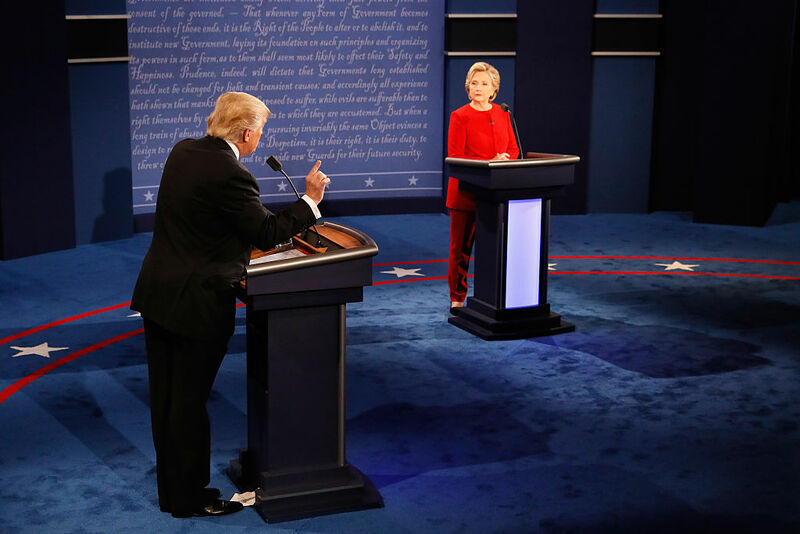 In the meantime, we’ll be watching the debates and counting Trump’s interruptions for the record — but we’re pretty sure Hillary will have no problem remaining as graceful and poised as she was last night, even through waves of manterruption.